The Camino | Camino Not Chemo! The Camino de Santiago has been around for about a thousand years. It began as a Catholic pilgrimage walk from western France, over the Pyrenees, across northern Spain, but now is walked by people of many faiths. There are even other routes, but the Camino Frances, the original, 508-mile walk, is still the most popular. We flew into Bilbao and began at the traditional beginning of the route called Camino Frances, in St Jean Pied de Port, France — it’s just east of Roncesvalles, Spain, below. Airports near the Camino route: Biarritz, Vitoria, Zaragoz, Pau, Bilbao, Pamplona, and farther away: Santander and Madrid. Check out the Facebook Page of Camino Not Chemo! See our clips of videos on the Camino de Santiago. Movie trailer for Emilio Estevez’s “The Way,” starring Martin Sheen (released in October 2011). I have most things on the list. Not more than 20 lbs, less if I can manage. I will get a backpack as soon as I can and load it all up and march up the Black Canyon. Then I will see what I can whittle down. (I do insist on multi-bug spray though. People have reported lice. Ugh. Tea Tree Oil helps against lice. Is usually a small 5 or 10 ml bottle. Can be found in any Whole Food Store. Just put a drop into the shampoo bottle. Wash hair as always. The shampoo will not foam any more but it will keep lice away. Thank you very much, Tina for your advice and care. I do have tree oil and a few other great (natural) items for along the way. I’ve cut my hair short as well, in anticipation for easier care. Nice to hear from you and thanks for following the camino blog. Camino al work…………………… Drinking coronas camino a santiago.. Happiness in a bottle. 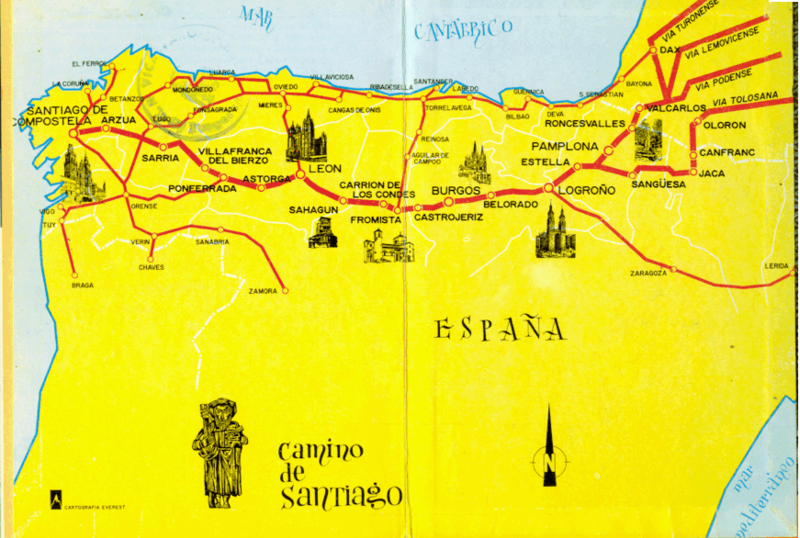 Because I think it is such a great thing you are doing Walking the Camino and I myself had never heard of it, I did look at the maps of the Camino and it came to my attention that you are starting on the French side of the Pyrenäen. I have heard from several sources that the French are very particular when it comes to language. I have heard that if you approach them speaking another language other then French saying something comparable with: “I do not speak French, do you speak English and can you help me” – They will not help you and give you a hard time. But if you attempt to speak French, no matter how poorly you do, they are the nicest people and will try to accommodate you in your language. This having said I do not know if you have considered taking an English/French dictionary with you? All The Power To You!! Although my French is a little better than my Spanish, it is fortunate that we won’t spend a whole lot of time on the French side. I like the idea of another dictionary but can’t find that ‘Langenscheid Lilliput’ version. The ones available in these parts are too big and too heavy. I’m hoping that this being a Pilgrimage route, people will be more kind. An amazing path to follow with great hope and spiritual findings in one’s self! The bravery and dedication is amazing! I did ‘el camino’ in may 2008. Everytime I try to explain what my experience was like I find myself speeechless. The experience is so unique and profound, that no words can explain it . Wheather you do it for religious, sport or turistic reason ‘ el camino’ always find a way to teach you many lessons. You encounter people that are so different in background and yet you realize that for 4 weeks you walk the same path, share the same roof, eat the same food, wear the same type of clothing, share the same physical endurance and reach the same objective. It is a once in a life time opportunity to have a real sence of living in communion with other human beings. Pilgrims don’t care whether you’re a celebrity or a common person, a well educated or a simple guy. We’re all the same, and we all help eachother along the way.Along ‘el camino’ you learn that given the right environment EVERYBODY cares about eachother. One day you’ll find youself helping someone without even thinking about it and when you’re in trouble any pilgrim would stop and take care of you. The pilgrims of el camino share one goal, that is to get to Santiago and we all help each other to reach that goal. Here is a great lesson to learn, ‘El Camino’ (in english it’s called ‘the way of St. James) awakens the social insticts that are intrinsic to human nature but remain dormant in our mundane life. Another face of ‘el camino’ is that because you’re disconnected of you everyday life, you have plenty of time to observe yourself. You have the chance to see how you feel and conduct yourself in the presence of ‘estrangers’, when you’re alone,in an unfamiliar environment, in contact with nature, etc. . This exposure allows you to learn a lot about yourself hence to grow as a person. If you’re considering doing “El camino” don’t hesitate, go for it!!! I had the time of my life.